We’d love your help. Let us know what’s wrong with this preview of A Christmas Escape by Anne Perry. Lonely Charles Latterly arrives at his small hotel hopi For countless readers, Christmastime means a delicious new holiday mystery from New York Times bestselling author Anne Perry. A Christmas Escape, her thirteenth noel to the season, transports us to the Mediterranean island of Stromboli for an unconventional Yuletide adventure—and an unforgettable volcanic encounter. Captivating in its depiction of untamed nature in all its awesome power, and of the human heart in the throes of transformation, A Christmas Escape gifts readers with Anne Perry’s talent for making the season brighter—and more thrilling. To ask other readers questions about A Christmas Escape, please sign up. Snitch Christmas book is the best ? Has anyone found book club questions about A Christmas Escape? The Christmas Escape by Anne Perry is a 2015 Random House publication. I would like to thank the publisher and The LibraryThing early review program for the lovely hardcover copy of this book. I always look forward to Anne Perry’s Christmas stories which has loose ties to her ‘Monk’ series. In this case Charles is on holiday on the island of Stromboli when a dormant volcano suddenly decides to awake from its long nap. 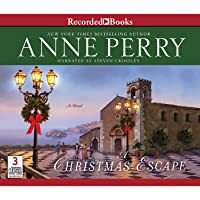 Charles is immediately befriended by a precious and delightful fourteen year o The Christmas Escape by Anne Perry is a 2015 Random House publication. Charles is immediately befriended by a precious and delightful fourteen year old girl, named Candace. She regales him with stories about their fellow travelers at the inn, and is especially excited about a well known novelist being in their midst. However, the atmosphere becomes tense as a sinister occurrence leads to murder amid the evacuation of the guests, and Charles finds himself responsible for Candace. The two must attempt to escape the volcanic fury, but must also escape a murderer. I had been hoping to add this book to my holiday reading in 2015, and thought it would make an excellent post for my blog, but sadly the book shipped out late, not arriving until nearly a month after Christmas, by which time I was pretty much burned out on holiday themed novels. So, since I was free from a looming deadline, I decided to wait a couple of months before starting this one. This is not a long book, and I read it in a couple of hours while stuck inside on a rainy Monday afternoon. While touted as a Christmas themed mystery, the book could be read at any time of the year, as it turns out,because the holiday atmosphere isn’t really present, and is not mentioned until the very end. Candace is the show stealer here, and the mystery is wrapped up around her in ways I would never have guessed. I loved the dialogue and the characters, but the volcanic eruptions gave the book a more depressing aura than I expected. In the end, however, I felt more respect for Charles and have faith he will do his best by Candace, and who knows, maybe in time, the two of them might make a great detective team. I've said it before, but it bears repeating. I love how the author has made a holiday tradition of writing these Christmas-themed suspenses each year for a side character from one of her historical detective series. This time, the hero is Charles Latterly, brother to Hester Monk part of the William Monk series. The holiday Christmas stories series have a series order, but the real connection isn't within this series. The connection is to the other series by the author. This book's character is c I've said it before, but it bears repeating. I love how the author has made a holiday tradition of writing these Christmas-themed suspenses each year for a side character from one of her historical detective series. This time, the hero is Charles Latterly, brother to Hester Monk part of the William Monk series. The holiday Christmas stories series have a series order, but the real connection isn't within this series. The connection is to the other series by the author. This book's character is connected to the William Monk series and can be read somewhere after the first few books. It functions well as a standalone, too. Charles' wife has just died and he is feeling adrift. He's middle-aged and is taking stock of his life and isn't pleased with what he perceives as a life devoid of success. So instead of spending a dreary Christmas at home, he takes a holiday trip to the Mediterranean isle of Stromboli. He is staying at a guest house up near the peak of the volcano so he can walk about to see the sites and explore the volcanic region. This one is a novella-length story so naturally it's development is succinct. I loved the build up and the climax, but the denouement felt somewhat abrupt. As to the build up, the author does a good job of developing each character, establishing the setting and atmosphere, and leaving the reader with a ticklish mystery in which several characters could be the culprit. The librarian saw me browsing the new book area and excitedly shared that the new Anne Perry Christmas book had just arrived. I guess she saw me browsing through another holiday release by a different author and figured I was interested in Christmas reads. Knowing that I have read and enjoyed a few of Anne Perry's past works, and yes, interested in a good Christmas book, I decided to give this read a try. I found it to be a very disappointing read. 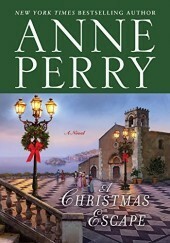 Set on the Mediterranean island of Stromboli, the The librarian saw me browsing the new book area and excitedly shared that the new Anne Perry Christmas book had just arrived. I guess she saw me browsing through another holiday release by a different author and figured I was interested in Christmas reads. Knowing that I have read and enjoyed a few of Anne Perry's past works, and yes, interested in a good Christmas book, I decided to give this read a try. Set on the Mediterranean island of Stromboli, the setting didn't necessarily say Christmas in my mind but ok, let's see where the author goes with this. We meet Charles, the protagonist. A recent widow who seems rather withdrawn and lonely. He is on holiday here in this island, I am guessing as a way to start some new holiday tradition? Sounds promising in general but the story is developed in a choppy fashion that I found it hard to get into the rhythm of her story telling. For starters, none of the characters are really developed. Maybe that is how it has to be in a novella, you just dive right in and aren't given the back story. I later realized that Charles is a minor character in the author's other books. Ok, so that might explain the limited development and explanation of the back story. But what about the rest of the characters? The ending seemed quick and abrupt...leaving me to wonder what happens next to the characters. The only reader I think I would recommend this book to would be a die hard Anne Perry fan. It probably makes more sense if you know and love her other characters. It took me a while to realize that this story is about Hester Monk's brother, Charles Latterly. Charles has decided to escape the harshness of a Victorian London Christmas and has journeyed to a small island in the Tyrrhenian Sea, off the north coast of Sicily, containing one of three active volcanoes in Italy. His hostelry is perched against the upper reaches of the volcano. Here Charles hopes to attain a measure of inner healing, a different perspective. What he find Christmas with a difference! Here Charles hopes to attain a measure of inner healing, a different perspective. What he finds is a strange mixture of guests and a volcano that appears anything but benign. The dark grumbling of that entity are viewed differently by the guests. Some are drawn to it, others repelled. Languid days, the mystery of the volcano, the sense of something almost mystical beyond the grasp of mere mortals colours the background and enhances the electricity amongst the various guests, all calmed by the host, Stefano whose culinary abilities seem to act at times as a soothing tonic not only for the guests but for the volcano itself. The English guests are a very different group--some grating, others ineffectual and yet others discerning. Charles is much taken, as am I, by the delightfully precocious teen, Candace Finbar. A young girl who sees to the heart of things way beyond the normal scope of understanding with a maturity that belies her years. Her's and Charles' unlikely, charming friendship becomes a central focus. All is not as it should be in this small guesting community and when the volcano spews forth it's anger and a member of the household dies, fleeing the danger portended by the volcano is spiked with the added realization that there is a killer amongst the company. A very unusual story that speaks on a multitude of levels, a Christmas offering with a difference. I received this from Net Galley to review. Anne Perry writes a short novella about Christmas every year. I really enjoyed last year's A New York Christmas so I was looking forward to this one. I was disappointed. The only thing Christmasy about this is the last day of the book it becomes Christmas Day. That's it. The novel is set in Stromboli in Italy that has an active volcano. Strangers and people with slight connections meets up at a lonely hostel in the hills of the Island. The one thing t I received this from Net Galley to review. The novel is set in Stromboli in Italy that has an active volcano. Strangers and people with slight connections meets up at a lonely hostel in the hills of the Island. The one thing that always amazes me is how the British always seem to know each other when they are in out-of-the-way places in Europe. It's the mark of a British cozy mystery. The plot is very thin and you can see the ending of the first chapter. There were no real surprises. It felt like an Agatha Christie draft of a book even though she never wrote about volcanoes, to my knowledge. These annual Christmas novellas are meant to be fluff pieces, but this one is fluffier than most. Charles Latterly travels to the Mediterranean island of Stromboli to spend a quiet Christmas holiday at an inn at the base of a volcano. The guests at the inn are a grab bag of characters usually found at country houses in a cozy mystery story. None of them too interesting except for a precocious 14-year-old traveling with her uncle.Tempers among the others seethe & meanwhile the volcano rumbles These annual Christmas novellas are meant to be fluff pieces, but this one is fluffier than most. Charles Latterly travels to the Mediterranean island of Stromboli to spend a quiet Christmas holiday at an inn at the base of a volcano. The guests at the inn are a grab bag of characters usually found at country houses in a cozy mystery story. None of them too interesting except for a precocious 14-year-old traveling with her uncle.Tempers among the others seethe & meanwhile the volcano rumbles & spits hot rocks (get it?). As the volcano erupts a body is found. Will Charles discover the murderer? Will they all escape the volcano? Isn't there something seriously creepy about the author insinuating romantic notions of a grown man to a young teenage girl? Anne Perry needs to get her writing act together. I enjoyed the Ann Perry novel I just finished enough that I decided to read another one. They are very short after all and both of these had Christmas themes. This one tells of recent widower Charles Latterly who decides to spend Christmas on Stromboli, an island off the coast of Sicily. He meets a very precocious teenager, but the other guests are unfriendly at best. As one would expect from Perry, they are all eventually suspected of murder. These characters are interesting enough, and the plot I enjoyed the Ann Perry novel I just finished enough that I decided to read another one. They are very short after all and both of these had Christmas themes. These characters are interesting enough, and the plot is well crafted enough, that I kept reading. But I will say that, as with the other Perry novel I read this year, this could have used a bit of editing. I wish there was a bit more history to it as well. Don't get me wrong: this is a fun little Christmas read that is worth the short period of time it will take to read it. Charles Latterly, Hester's brother, has been a shadow character in the series so far - appearing occasionally, but not one you feel you know (an acquaintance of the reader, if you will) - so being the central character is something new, and very welcome. He's passing the Christmas holiday in Stromboli, a small island off the Sicilian coast. At first his manner is reserved, his regret evident, but as the atmosphere and his host work their magic he welcomes the change, becoming almost playful as he Charles Latterly, Hester's brother, has been a shadow character in the series so far - appearing occasionally, but not one you feel you know (an acquaintance of the reader, if you will) - so being the central character is something new, and very welcome. He's passing the Christmas holiday in Stromboli, a small island off the Sicilian coast. At first his manner is reserved, his regret evident, but as the atmosphere and his host work their magic he welcomes the change, becoming almost playful as he learns to respect the surroundings. But this is not your typical feel-good Christmas novella: just knowing the author leads you to expect something sinister, a mysterious death. Two questions remain: who will survive, and where is the bigger danger: a murderer, or the volcano? This review has been hidden because it contains spoilers. To view it, click here. Charles Latterly goes to the Mediterranean island of Stromboli for Christmas. He's recently lost his wife and he seems pretty detached from his feelings and life in general. He's hoping the change in setting will allow him to find meaning to his otherwise empty existence. He meets a group of English tourists. It's obvious from the start who's going to be murdered. Then the active volcano erupts and Charles does his bit to protect as many people as he can. He also finds out who the murderer is. Per Charles Latterly goes to the Mediterranean island of Stromboli for Christmas. He's recently lost his wife and he seems pretty detached from his feelings and life in general. He's hoping the change in setting will allow him to find meaning to his otherwise empty existence. Personally, I'm not sure why this is called a holiday novel. There's not one bit of it that reads like a holiday story other than saying it's set at Christmastime. I found it predictable and disappointing. I enjoyed this, quick read- one sitting. 3.5 stars. I enjoyed this Christmas novella with Charles Latterly from Anne Perry's Monk series. It wound up being an exciting story as they tried to flee from an active volcano on an island. A quick read. Intrigue trop simple et surtout AUCUNE ambiance de Noël ! Déçue. The protagonist of A Christmas Escape she uses the forty-something brother, Charles, of the female partner, Harriet, of her Monk series. The story is told from his perspective in 3rd person limited narrative style. He is This novella, set on Stromboli, the volcano/island off the coast of Sicily, is the 13th Christmas novella by this well-known writer of historical crime fiction. She uses minor characters from her Thomas Monk Victorian Mystery Series as the protagonists of her Christmas novellas. "...the huge looming mountain, the arch of the sky, which was already darkening in the east. The fire of sunset in the west was painting the sea with color. A faint wind stirred, carrying the scent of grasses." Please visit my full and illustrated review at Italophile Book Reviews. I received a review-copy of this book. This is my honest review. Anyone looking for a historical Christmas mystery has come to the wrong place. Anne Perry has created a short, small predictable mystery but thrown in the whole Christmas thing as an afterthought. Nothing about this story screams Christmas except perhaps the last line. Charles has gone to a small island for the holidays to bask in the sun on the side of the volcano. Things take a dark turn when one of the men staying at the "hotel" (more like B & B) says that someone tried to kill him. As if Anyone looking for a historical Christmas mystery has come to the wrong place. Anne Perry has created a short, small predictable mystery but thrown in the whole Christmas thing as an afterthought. Nothing about this story screams Christmas except perhaps the last line. Charles has gone to a small island for the holidays to bask in the sun on the side of the volcano. Things take a dark turn when one of the men staying at the "hotel" (more like B & B) says that someone tried to kill him. As if things couldn't get anymore dangerous the volcano starts to grumble. Are they all in danger? Will the volcano blow? A quick read narrated beautifully by Steven Crossly. This is the latest in the author's Christmas series. It is the first one I have read, to find that Charles Latterly, a recent widower is spending it in on Stromboli. So not your traditional Christmas fayre! At first reticent, Charles comes out of his shell and begins to embrace the island with its volcano. There is a wide array of marvellous characters, a death and rumblings from the volcano to liven up the proceedings considerably and the build up of suspense. This is a quick and entertaining re This is the latest in the author's Christmas series. It is the first one I have read, to find that Charles Latterly, a recent widower is spending it in on Stromboli. So not your traditional Christmas fayre! This one took me too long to get through, considering how short this novella is. It didn't draw me in. During the first half of the book, the only thing remotely interesting were Perry's descriptions of the meals the characters ate. I couldn't tell what time period the book was set in, although a blurb somewhere hinted at it being Victorian historical mystery fiction. This could have been set in any time period, notwithstanding a few nods towards Victorian conventions. The novel finally picked u This one took me too long to get through, considering how short this novella is. It didn't draw me in. During the first half of the book, the only thing remotely interesting were Perry's descriptions of the meals the characters ate. I couldn't tell what time period the book was set in, although a blurb somewhere hinted at it being Victorian historical mystery fiction. This could have been set in any time period, notwithstanding a few nods towards Victorian conventions. The novel finally picked up pace around 60% (yes, I was reading this as an ebook). However, it was fairly predictable, at least on part. Another complaint is that at the conclusion, not every thing is completely resolved. I still had unanswered questions. Not to complain entirely, the book is written in clean, simple prose, with no profanity or inudendos. As this was my first Anne Perry book, someone had recommended I would like her regular (not Christmas) books better, as she does a better job of setting up the characters and atmosphere in them. I may or may not give another one a chance. As this was touted as a Christmas novel, I will say I had been hoping for a little more Christmas references than just the book occurring on a holiday abroad for the characters and concluding on Christmas Day. There's more to Christmas than a date on the calendar. Beautiful Island, Mediterranean island of Stromboli, with an active volcano, a dead body, and a mystery. Charles Latterly just lost his wife and wants to escape the loneliness. Casts: A pompous novelists, a stuffy colonel, a dangerously ill-matched married couple and an ailing old man. An orphaned teenager Candace Finbar. I loved the interesting characters, the non-stop action, and the simple plot. When nature erupts the tension increases, and the truth comes out. What an ending! This is a good light hearted read. But it’s not as cozy as her other Christmas novels. If you’ve just been watching Durrells in Corfu this is a good way to continue that atmosphere since it takes place on an island in Italy. First Sentence: Charles Latterly stared across the untroubled sea at the shore they were fast approaching. Hester Monk’s brother, widower Charles Latterly wishes to escape from the holidays in England and travels to a small hotel on the Italian island of Stromboli. However, with the exception of the innkeeper, an elderly man and his niece, neither his co-visitors, nor the island’s volcano, prove to be very restful. When the volcano starts to make its presence felt and one of the guests is found m First Sentence: Charles Latterly stared across the untroubled sea at the shore they were fast approaching. Hester Monk’s brother, widower Charles Latterly wishes to escape from the holidays in England and travels to a small hotel on the Italian island of Stromboli. However, with the exception of the innkeeper, an elderly man and his niece, neither his co-visitors, nor the island’s volcano, prove to be very restful. When the volcano starts to make its presence felt and one of the guests is found murdered, Charles realizes they must escape the hotel, and the killer among them. Perry creates such wonderful descriptions--”The mountain rose sharply, as symmetrical and uncomplicated as a child’s drawing.”--that places come to life under her deft hand. One can’t but smile at her analogy of the volcano…”…it’s mostly like a lot of old people: It complains and uses some harsh language, but it doesn’t really do anything.” Or, at least until it does. Charles is a strong protagonist yet interesting in that he rather fades into the background, letting others, particularly Candice, the delightful 14-year-old, her uncle, and Stefano the innkeeper, take center stage. It’s a cleverly done balance and one that works extremely well. At the same time, Perry effectively introduces us to all of the characters through a conversation which also provides a sense of their personalities and relationships. One doesn’t always think of Perry and food, but being set in Italy, how could food not be included—“fresh crusty bread, slightly salty butter, and think dollops of homemade apricot jam.” And that is just the start. “A Christmas Escape,” set on a volcanic island, provides suspense and sense of grave danger which escalates at a breath-taking rate as the story progresses. Yet it is the vividness of Charles and Candice that leaves one hoping they will reappear in the future. excitable read that will definitely keep your attention as it was for Charles Latterly's three week adventure where he finds himself on the 'Mediterranean Island of Stromboli' in Tyrrhenian dealing with a awful volcano. We find that Charles had left London to get away after the death of his wife. Will this "heal the sense of helplessness and the bitterness of endless small failures" that had happened in his life? The characters in this novel were all very interesting...well developed, well portrayed and even some shady ones that would keep the readers turning the pages. Will this be a tranquility time for Charles as he had hoped it would be as he meets these people [Stefano, Finbar, Candace, Walker Bailey, Isla, Bretherton and Quinn] whom he would be traveling with? What will happen after Charles meet Candace and her uncle Finbar? Will Charles be able to keep a promise he made with Finbar? What will happen as the volcano gets worse and a body is found? I liked the descriptions of the foods that Stefano prepared so well for the guests[creating dishes that would dazzle all the senses]. To get all of these questions answered in this short read and a lots more you will have to pick up this authors mystery thriller to see how it will all come out. Who will make it out of this island alive to hear the ng them know it was Christmas and the 'Time of Hope, for everyone?" I believe this is Perry's thirteenth "Christmas" book, though it's the first I have read. I received my copy from NetGalley and was thrilled to do so because I've been meaning to give Perry a try and this was a good excuse to do so. Overall it was an enjoyable short read. I'm only giving it three stars out of five, though, because of the lack of seasonality that I was anticipating. Charles Latterly (the brother-in-law of Perry's Victorian detective William Monk) is vacationing before Christmas on I believe this is Perry's thirteenth "Christmas" book, though it's the first I have read. I received my copy from NetGalley and was thrilled to do so because I've been meaning to give Perry a try and this was a good excuse to do so. Charles Latterly (the brother-in-law of Perry's Victorian detective William Monk) is vacationing before Christmas on the volcanic island of Stromboli. The property where he is staying already has a handful of other guests who all know eachother -- teenager Candace Finbar and her great- uncle, the married bickering Baileys, uppity Colonel Bretherton and novelist Quinn. Charles immediately bonds with the Finbars and the property owner, Stefano. He's also immediately aware of the tension surrounding his relaxing vacation -- not only from his fellow guests but also from the volcano. This was the first book I have read by this author and was referred to it by another library patron. Apparently Ms. Perry writes a short Victorian-era mystery novella set around Christmas every year, using one of her side characters from her William Monk series (not the "Monk" of TV series fame). The protagonist's wife has died recently and questioning the value or success of his life thus far, he decides to escape for the Christmas holidays to the Mediterranean island of Stromboli, Italy near th This was the first book I have read by this author and was referred to it by another library patron. Apparently Ms. Perry writes a short Victorian-era mystery novella set around Christmas every year, using one of her side characters from her William Monk series (not the "Monk" of TV series fame). The protagonist's wife has died recently and questioning the value or success of his life thus far, he decides to escape for the Christmas holidays to the Mediterranean island of Stromboli, Italy near the peak of a volcano, to hike and explore the sights. He stays in a charming place where guests have separate rooms but all of their meals are served and eaten together. The host is a kind, wise, cheerful Italian man who is an excellent cook and delights Charles with his tasty offerings. The other guests are a mixture of ages and temperaments, with a lot of sarcasm and quarrels. Soon the volcano begins to stir, someone is murdered, and there is a mystery to be solved. A delightful escape from the English snowy holiday, off to Stromboli for Christmas -- and a hotbed of intrigue among the British visitors to a volcanic mountainside inn. Hester Monk's brother, Charles Latterly, finds himself with a refreshingly intelligent young teenager, as well as with a charming innkeeper who is a master cook. The story has a reliable set of an assortment of British standbys ... and something nasty hidden among them. The characterizations, the motivations, the intrigue among A delightful escape from the English snowy holiday, off to Stromboli for Christmas -- and a hotbed of intrigue among the British visitors to a volcanic mountainside inn. Hester Monk's brother, Charles Latterly, finds himself with a refreshingly intelligent young teenager, as well as with a charming innkeeper who is a master cook. The story has a reliable set of an assortment of British standbys ... and something nasty hidden among them. The characterizations, the motivations, the intrigue among the cast are far more interesting than the plot, which nevertheless holds it all together--and blows it all up in the end. Great fast read, entertaining and revealing of human nature ... and reading this in early December 2015 with Nicaragua’s Momotombo volcano erupting for the first time in 110 years, spewing ash and lava thousands of feet into the air. It's been dormant since 1905. Charles Latterly, a widower, decides to spend a few weeks staying in a house under the shadow of the volcano Stromboli while he does some serious thinking about what he wants to do with his life. It is the year 1866. Charles hopes for lots of long walks, good food and time to think and relax. The volcano has other ideas. His fellow guests are an interesting mixture of pleasant and thoroughly nasty and one of their number is found murdered just as the party has to make its escape from the eruptin Charles Latterly, a widower, decides to spend a few weeks staying in a house under the shadow of the volcano Stromboli while he does some serious thinking about what he wants to do with his life. It is the year 1866. Charles hopes for lots of long walks, good food and time to think and relax. The volcano has other ideas. His fellow guests are an interesting mixture of pleasant and thoroughly nasty and one of their number is found murdered just as the party has to make its escape from the erupting volcano. Can Charles lead all of them - including the murderer, to safety? I received a copy of the book from Netgalley in exchange for a fair and honest review. Anne Perry's newest Christmas book is different from the rest. Instead of being set in cold and raining England, the action takes place on a warm, sunny Mediterranean island with a cantankerous volcano. The protagonist, Charles Latterly, is spending the holidays at a charming hotel with fellow Brits. The mood turns ominous when the volcano stirs, and the guests fear it is about to erupt. The plot of this book i I received a copy of the book from Netgalley in exchange for a fair and honest review. The plot of this book is fast moving and gripping. I read almost the whole book in one sitting. The descriptions of the volcano were interesting to the point where I was hoping it would erupt just because I knew it would be so spectacularly described. My only issue is that I wasn't ready for the book to end. I became invested in all the characters and wished to follow their story lines even farther. I really enjoyed this book and would recommend it to my library patrons. Yet another winner from Anne Perry. I'm always impressed by how thoroughly she draws me into the scenes she writes of. In this unusual Christmas mystery, a volcano plays so large a part as to nearly become a character in its own right. The murder does not happen until late, but the story is so good I didn't mind. This story has just the right amount of foreshadowing to make the murder and its solution believeable, but I wasn't sure if my guess was actually going to be right for a while. And the Yet another winner from Anne Perry. I'm always impressed by how thoroughly she draws me into the scenes she writes of. In this unusual Christmas mystery, a volcano plays so large a part as to nearly become a character in its own right. The murder does not happen until late, but the story is so good I didn't mind. This story has just the right amount of foreshadowing to make the murder and its solution believeable, but I wasn't sure if my guess was actually going to be right for a while. And the descriptions! The volcano "making noises like Bailey does when he sleeps" was one of my favorites.